Be prepared to suspend belief and once again believe in magic with Alice Hoffman as she weaves a tale of sorcery and enchantment in Nightbird. 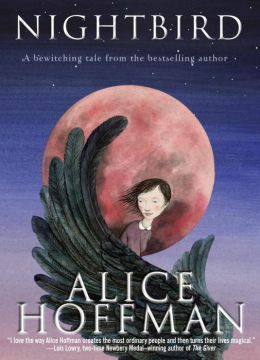 Although the book is targeted for middle school readers, adults need a fairy tale every now and then to remind them “to be kind and have courage.” When Alice Hoffman tells the story, those strange happenings seem very plausible. The sleepy New England town of Sidwell celebrates it most famous citizen, an eighteenth century witch who may have cast a spell to dry up all the lakes. Each year, kindergartners star in a play retelling her sad story of being abandoned on the eve of her wedding. Hoffman’s story focuses on the witch’s descendants, Twig, a quiet little girl who tries to be invisible, and her brother James, born with a strange and amazing ability, who hides away from everyone – not to be seen. When two young girls move into the cottage next door, the old home of the notorious town witch, the interaction among the children produces a tale of friendship, caring, and magic. Hoffman adds an innocent winged beast seen flying over the church bell tower, an endangered breeding ground in the woods targeted for development, and a frumpy Ph.D. who specializes in owls – mixes them all together – and delivers a delicious story with a message and a happy ending. If you enjoyed Hoffman’s adult books – Practical Magic, The Museum of Extraordinary Things, and her historical novel The Dovekeepers, you will relish this short book – a lovely modern fairy tale. And, for good measure, Hoffman includes the secret recipe for Twig’s mother’s Pink Apple Pie at the back of the book – I can’t wait to bake it. This entry was posted in authors, book review, books, mysteries, romance and tagged Alice Hoffman, Fairy tale, mystery, New England witches, Nightbird, Roma Downey, romance. Bookmark the permalink.